After updating the mainnet OriginTrail node with the latest release only a couple of days ago, we are taking a much bigger step forward in the development of the protocol. Today, we are happy to release the first major update — version 3 of the protocol — which includes big features, a lot of bug fixes, and other cool improvements. It marks the beginning of the OriginTrail’s Freedom stage on the OriginTrail testnet. The most important change that comes with the new release is the introduction of litigation mechanisms in the OriginTrail (OT) protocol. The litigation capability is essential for ensuring reliable service from the public, permissionless network for every participant. At its core, it is a system of complex cryptography mathematics and economic incentives. The Freedom release brings the first version of the litigation mechanism, which enables Data Creators (DCs) to test and litigate Data Holders (DHs). Simply said, every DH node that “wins” a DC’s job offer can be tested for the entire duration of the “holding time.” At the same time, if there is a missed test or a wrong answer provided to the test, this will be litigated by the DC with help from the smart contract. If a DH fails to answer litigation, it will be replaced by one new DH in a process called the Hydra replacement. The litigation mechanisms are designed to preserve datasets on the network — should data corruption or potential deliberate modification occur — in the form they were originally published. DH nodes are therefore tested from time to time to ensure they still preserve data in the proper form. If a DH node fails to complete a test properly, then the DH risks losing its deployed stake (only the stake for that agreement), which is then used in the Hydra replacement process. For more details about the litigation mechanism, see http://docs.origintrail.io/en/latest/network-structure.html#litigation-procedure. Continuing with the improvements introduced in the v2.0.50 release, the Freedom release brings the same update for the job distribution and additional support for node connectivity with Ethereum, with the goal of lowering dependence on RPC services like Infura. Starting from this release, the user is required to provide their own RPC host URL for such service on the testnet. More on this can be found here. Additionally, we have upgraded the auto-update capability, which will make it easier to update your node with the upcoming releases and allow updates to happen live without the requirement of restarting your node. Please note that this only applies to the Docker-based installations. Among other stability upgrades, this release brings a lot bug fixes of which the most notable are improvements with the withdrawal mechanism and logging limiter. When Should You Update Your Testnet Node and Who Is Affected by This Release? All users running a node on the OriginTrail Testnet are advised to update to the Freedom release. Particularly, this release affects all the nodes using the Docker installation fetched from the tag quay.io/origintrail/otnode:master or manually installed from OriginTrail’s repo from the master branch. Installations that use Docker should be stopped, their configurations updated, and started again to trigger the update. Make sure to have prepared your own RPC URL, either by registering at Infura or setting up your own Ethereum node. The procedure for the update is available here. The team has been working on Freedom for the past several months, carefully testing the mechanisms in our local environments. Deploying the first public network with litigation mechanisms is an important step in the development of the OriginTrail ecosystem and the OriginTrail Decentralized Network. 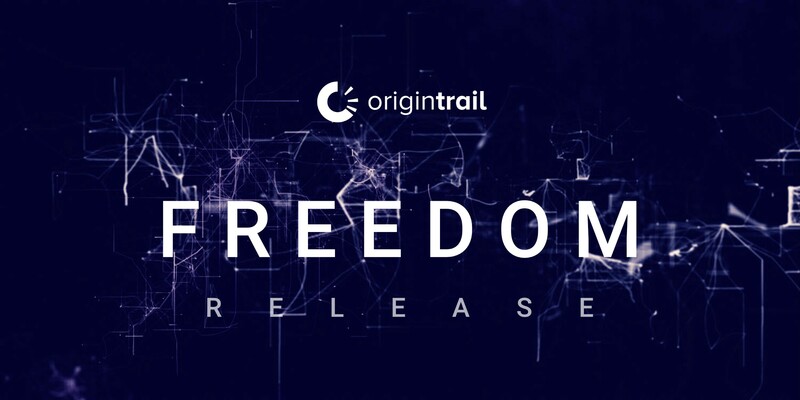 As it presents a major update to the protocol, Freedom needs to be tested in the public environment of the OriginTrail Testnet. We encourage the developer community to join in and help the transition to Freedom by running a testnet node and providing improvement proposals and feedback via our development communication channels on Github and Discord. More updates from the OriginTrail development team are coming soon. Stay tuned!